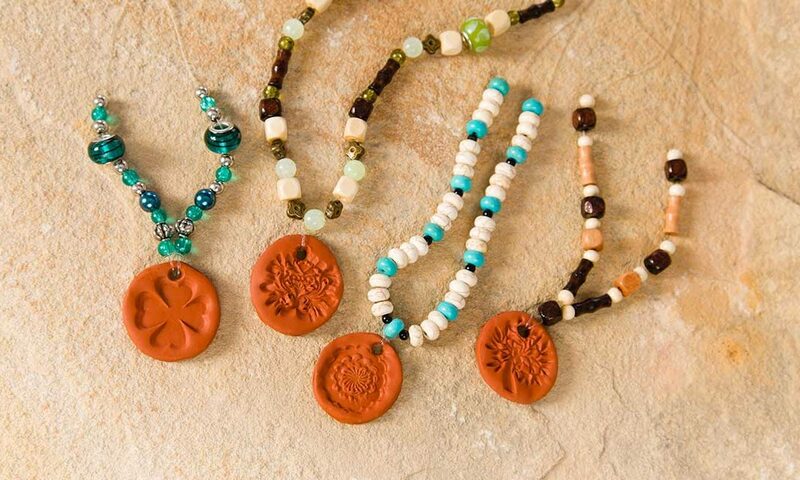 This Aromatherapy Jewellery is made out of natural terra-cotta clay that absorbs essential oils. While this tutorial is for a necklace, try making any type of jewellery: earrings, necklaces, bracelets, pendants, beads, etc. 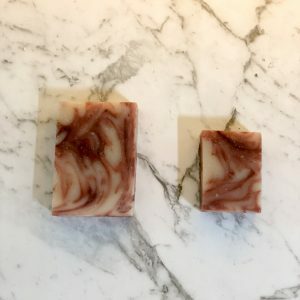 Once the clay is sculpted and dried, add a few drops of an essential oil or blend to the jewellery to experience the power of essential oils throughout the day. Note: This tutorial can also be use to make car air fresheners, Christmas ornaments, key chains, and more. Tip: Store your scented jewelry when it is not being worn in your linen closet or dresser drawers to keep fabrics smelling great. Grab a handful of terra-cotta clay and rub in palms of hands until it’s soft and pliable. Place a piece of wax paper on the table. Use the rolling pin to roll out the clay until it is ⅛ inch thick. Take the round object and press firmly into the clay to make circle pendants. Remove the excess clay from the cut out pendants. Take each pendant and stamp a design into clay. Take a shish kabob stick or toothpick and make a hole in the pendant. Make sure the hole is big enough to fit two strands of string into. With the left over clay, make a few small round beads and put a medium to large size hole in the center of it. Once all the pendants have holes, place them on a cookie sheet covered in aluminum foil and bake or air dry according to the specifications provided with your clay. If baking in the oven, be careful to not overbake. They may seem bendable as soon as they are taken out of the oven, but they will harden once cooled completely. Once cool, use sandpaper to lightly smooth away any rough edges. 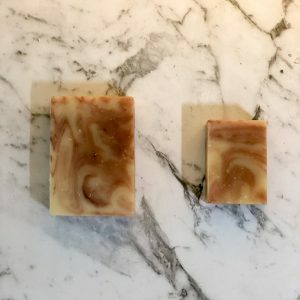 It will temporarily change the color of the clay, but will return to normal once essential oils are applied. Take a string and cut it to desired length. Add 4–5 extra inches just to be safe.The string can be cut shorter later on. Take the pendant and put both ends of the string through the hole. Pull the ends through and put them through the loop. Pull tight. This will help the pendant lay flat on your chest. For a longer necklace, tie the two strings together. Tip: For a shorter necklace, tie one end of the necklace in a knot a couple inches down. Place a bead on next and then tie a knot on top of the bead so it remains securely in place. On the other end of necklace, tie a loop that is large enough for the bead to fit through. Cut off any extra string. To take your necklace on and off, simply put the bead in the hole that will act as a clasp. Add 1 drop essential oil or blend to the pendant. Rub the oil around. Enjoy the benefits of essential oils throughout the day. If the scent begins to fade, add another drop to the pendant. Remember, a little essential oil goes a long way.